Chartboost’s S2S tracking lets you leverage install attribution from third-party platforms to create CPI campaigns on the Chartboost network. Apps may advertise using SDK attribution or server-to-server attribution. If you plan on spending more than $1,000 per day, you may use server-to-server attribution through a third party. Add click callbacks by going to the Callbacks panel of your dashboard and clicking Add New Callback. Create a click callback using a third-party template from the Template dropdown. Be sure to select the template that applies to your app’s OS platform (iOS or Android). You will be prompted to enter additional information required by the third party, such as a bundle id. After filling in the callback template, attach the callback to the click events of the app you want to track via the third party. Select the app, go to APP SETTINGS > Basic Settings > Advanced Settings, and select your click callback from the dropdown. Go to your dashboard’s callbacks panel and click Add New Callback. From the Template dropdown, select the Completed View template for your partner (e.g. “Tune iOS Completed View”). You might be prompted to add your bundle ID or other information. Find the app(s) for this callback in the list below your callback details. Check the box in the View column. To ensure the best targeting and performance of your apps, bootup / install notifications must always be called within the first few seconds of your app launching, regardless of any other actions or user interactions within your app. Reach out to your account manager to enable S2S for your account. If you are new to Chartboost, we require a minimum deposit of $5,000 into your account to enable S2S features. Please add more funds to your account and then contact us. If your app was SDK-integrated and being promoted by a Chartboost advertising campaign before you requested S2S tracking, you may be billed for SDK-driven installs up to 21 days after conversion is complete. After conversion, the install attribution window will be according to the third party, with a minimum of 7 days. 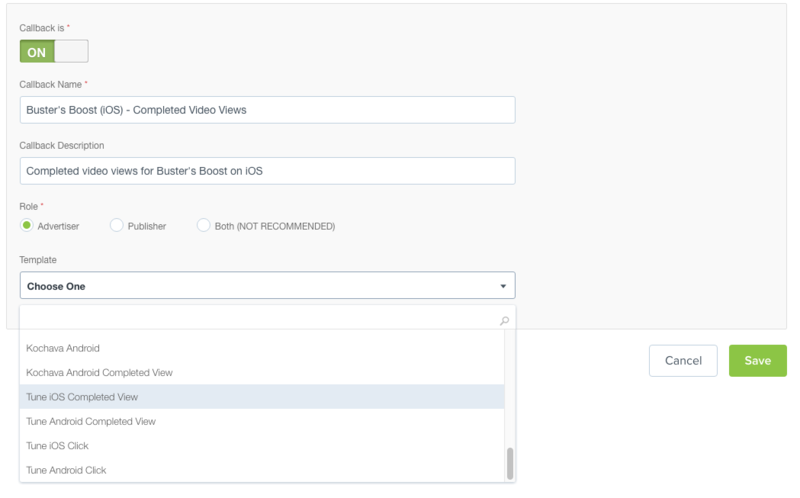 View-through attribution (VTA): Track installs that occur shortly after a user watches a video ad but does not click on the ad.